Nathan Kring, interim executive director, Tipton County Economic Development Organization. At 28 years old, Nathan Kring is doing what nobody else in Indiana at his age is doing — leading a local economic development organization. 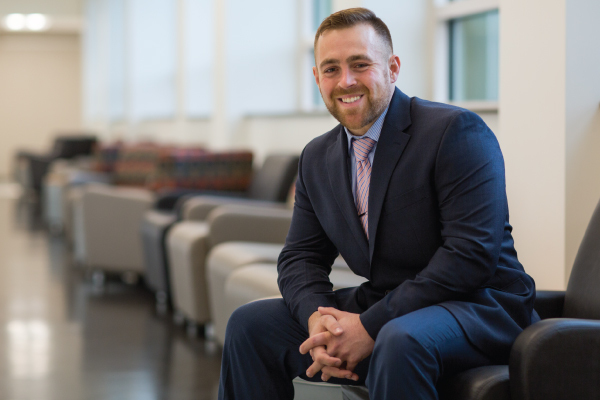 At the same time, he is completing a master of business administration (MBA) degree at IU Kokomo after a four-year stint as an interpreter with the U.S. Army’s 10th Mountain Division. A graduate of Tipton High School, Kring earned bachelor’s degrees in chemistry, economics and classics from Wabash College, where he also played football. Upon enlisting in the Army in 2010, he earned associate degrees in Arabic and Middle Eastern studies before medically retiring in 2014. As interim executive director of the Tipton County Economic Development Organization, Kring is working to revitalize downtown Tipton, make the county more attractive to potential residents and obtain more grants to train unskilled workers. When Kring completes his MBA in August, he’ll lose the interim tag from his title after starting at TCEDO as project and communications manager in October 2015. But he’ll also serve as a shining example of what regional campuses such as IU Kokomo are trying to accomplish by enabling Hoosiers to enhance their skills and apply them where they are most needed — in their own backyard. To learn more about Kring and his story, read here.